Is in this constellation the proper direction of play? After white chose not to complete the joseki, but to play the wedge at . Can black take advantage of this? AndyPierce: Yes, black can seal off the white corner group from the rest of the board by playing a. Just how much of an advantage that is remains to be seen. I don't think white's wedge at is inherently bad if this is part of white's whole-board plan. See also JosekiAndTenuki. Was the correct idea, or should black have pincered from the other side at a? looks bad to me now, should black attack white with b or c or rather switch to another big point? dnerra: Up to all black moves (including ) look very natural to me. I think ( ) is the right idea, but a simple nobi would be a bit better: White still has to reply in the corner, and then black doesn't have to strengthen white with the / exchange. is trying to secure a large corner...How vulnerable to invasions is this formation now? After the white corner looks a bit suspicious to me...Can the white corner be killed or is it just a wasted move? Two weak and potentially heavy white stones . A very weak white group . A very heavy and potentially black group . 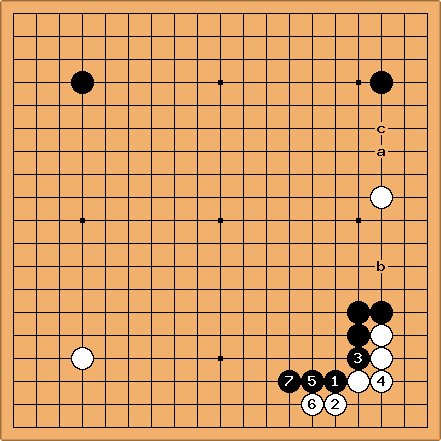 A white corner that is alive but still allows many black sente moves. I think you should by now understand that the lower right is the hot area. Under no circumstances is black allowed to tenuki from here! Every move there (even a mediocre one) will help to shift the balance of power in black's favor. Personally, I would start with the sequence shown here ( is necessary to make life), and aim at attacking the group. But certainly many other sequences are possible. iff: Ok - weakens the black group a bit. My reason for playing however was that I thought the black group is not in any immediate danger and once it is settled the 2 white stones will be caught between two strong black groups with the standard attacks a and b possible. Plus the upper corner gets bigger with ... Is that completely unreasonable thinking on my side? dnerra: I would also play . I don't see the black group as weak, and I would say that - nicely induces . 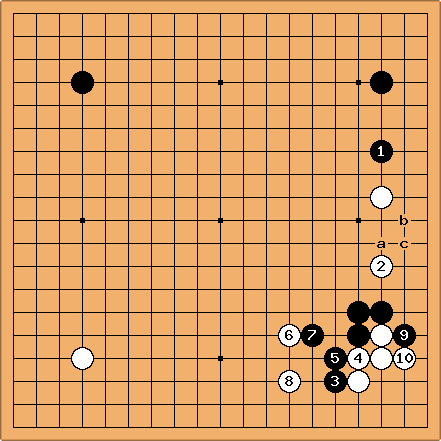 Although a now is too close to his own thickness, it remains available, in case the ladder at b works for White. It is unlikely though that the corner would settle down with the ladder aji still around. 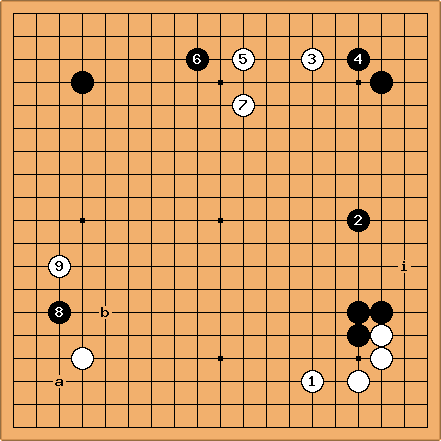 The hane at c is a weakness for White and strengthens Black more than the hane at d.
... White's proper move is this hane. 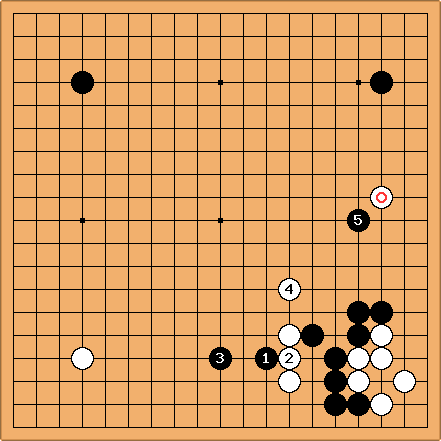 (Joseki issues:) I don't know whether should be at a instead. I think if it does, then the - exchange favours Black. Also, if at , at captures a big corner. If at immediately, at can force Black into slightly worse shape. (Fuseki issues). After this diagram, a has clearly become more interesting for White than b. On the other hand, it doesn' really hurt the corner either. Black will make a comfortable shimari. If he were at the other 3-4 point, he'd have to play kosumi, which loses a little. All this makes me believe that the wedge was not a prime idea in this fuseki, but here I am on thin ice. unkx80: Dieter said that exchanging Black a with White b weakens the Black group, and then later proceeds to say that (without the exchange) c would be more interesting to White compared to b. This sounds like a contradiction to me. Rather, I think that if the Black a and White b exchange can be made, the exchange is favourable to Black because if White has to form a base on the side, then White's corner group will be affected. 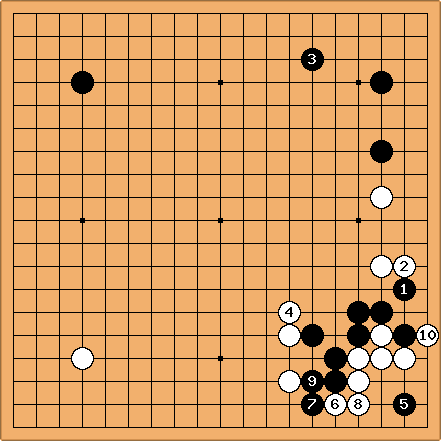 The only remaining problem is, whether White will really play at b if Black plays at a.
Alex Weldon: Also worth noting (in terms of why the wedge wasn't the best idea for W here, though it's sometimes playable); we now have a low, strong position in the lower right, creeping out towards W's hoshi in the lower left. That corner is now devalued for W. If that stone was at, say, san-san, it'd be a different story. (iff: could you please elaborate on this (hoshi vs san-san) a bit more?) So if you want an example of when the wedge would be playable, imagine W san-san in the lower left, and B's upper right komoku facing the other way. Elaboration requested by iff: Hoshi aims to develop on a large scale, while san-san is self-contained. Therefore, the value of a hoshi stone is strongly affected by what's going on nearby. 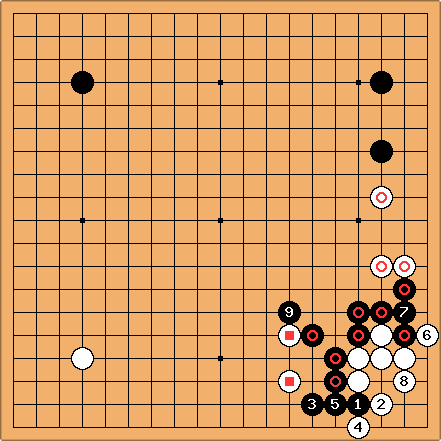 Low positions, in which both sides are strong (especially where one person is crawling towards the hoshi, and the other is building a wall facing away from it) or other situations in which a side of the board is "played out" tend to reduce the value of a hoshi stone, and allow the opponent to invade san-san and cause overconcentration in your position. 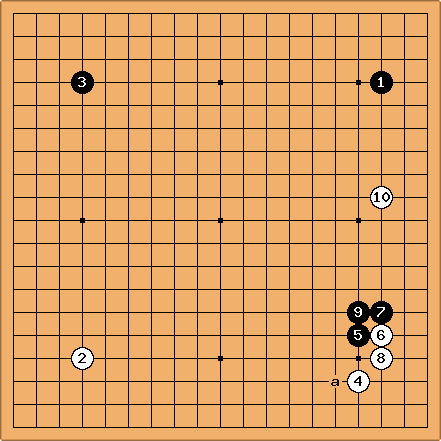 San-san, on the other hand, will take about the same amount of territory, no matter what the opponent is doing on adjacent sides of the board. Meanwhile, it is itself a low, strong position, and reduces the value of thickness and high, developping positions nearby. iff Thanks a lot for your elaboration (the concept of "low" however is not quite clear to me: Does that just mean on the 3rd row or is there more behind?). I try to rephrase a bit to see if I really understand you: The idea of a hoshi is large-scale development. So if your opponent is not yet strong in the hoshi's neighbourhood an invasion at 3-3 is not a problem because you get thickness to the outside and will profit from that. If however the opponent has a strong position near the hoshi you have to worry about a 3-3 invasion as you might not be able to profit from the thickness you get. Therefore typically a game development in which your hoshi is approached by a strong group is a loss. Is that about right? Alex Weldon: Low just means 2nd or 3rd line. High means 4th and above. You've got it, more or less, though it's not neccessary for a san-san invasion to happen to result in a loss if low, stable positions approach your hoshi. Really, it's just that low, stable positions are detrimental to moyo building, which is what hoshi is for. If you can't use the influence of your hoshi stone, you have to use it for territory, either by closing the corner, or making a short extension from the wall after san-san (because the long one is blocked), but using hoshi for territory in these ways is inefficient. iff Thanks a lot again...this is really very useful stuff for me. The one thing I still don't understand is the relevance of the "low": Does not a high - in fact any - stable position in the surroundings of your hoshi devaluate it for moyo building? Suppose that Black plays instead, and that play continues as in the game up to . Now Black can play - with sente. Now - makes this White group heavy. continues the attack. Then after, say, , leans against , attacking White's weak group on a large scale. OC, this attack depends upon waiting to see what happens in the bottom right before attacking . Timm(5k): - seems wrong to me. is saying “please reinforce yourself” and “oh, finally I want to pincer because that right side looks too promising”... Now is stuck in-between a (probable) Black shimari and thickness and is going to get under attack. Yet I totally understand because finishing the corner would have given Black a sort of deluxe Kobayashi Fuseki while White wouldn't have had much prospects. So I think that was a bad joseki choice and that White should have considered a loose pincer or a knight's jump instead. Of course I'll happily leave the final word to people stronger than me. If - then I can imagine a continuation like this one. Black can now choose to jump into the corner or move out. Although doesn't seem to work well with the star point at the lower left, taking sente to reduce the top and then let Black decide how to move in the lower left, seems an appropriate strategy to me. If White wants to build, can be on the 4th line, althought that move is quite unusual I believe. 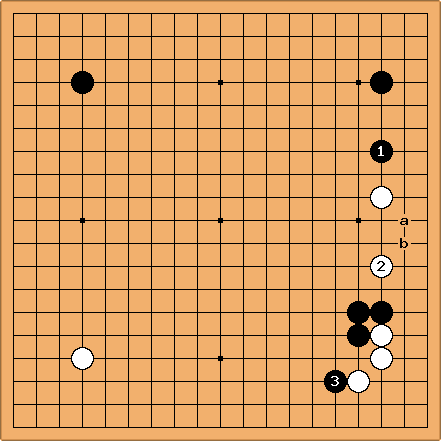 The compromised diagonal at a is bad aji for White. Of course, is such a natural move that one wonders what could be wrong with it. Too few amateurs play this simple move. 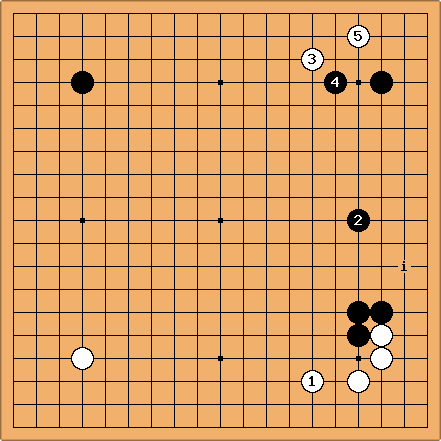 Now works badly with the upper right, so it may be better at a but then it's Black leaving aji on his major side. 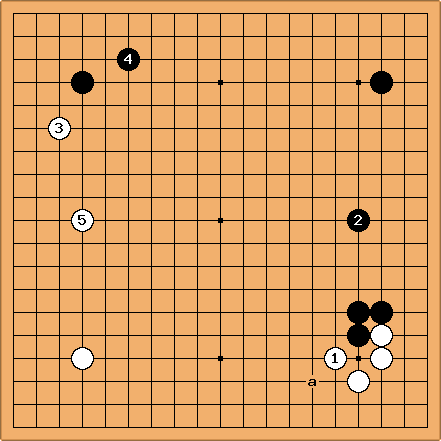 Anyhow, White can now take the initiative to play in the upper left, at b or c.
tapir: is good. The problem is that even perfectly good moves are often played absent-minded without thinking of the consequences. At White unnecessarily panics about the framework and jumps right into it. Imo, the whole panic is due to not considering the funny business at e.g. i (in simple diagram) and treating the framework as almost territory.